The soft exosuit in action. Before robots get intelligent enough to overthrow us they're going to prove very useful - as a new exoskeleton suit from the US Defense Advanced Research Projects Agency (DARPA) proves. 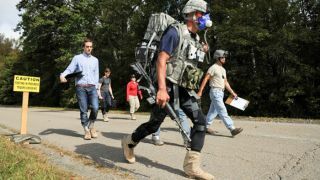 Currently undergoing testing in Maryland, the high-tech suit takes some of the strain from soldiers' waist and legs, which means they can carry heavier loads for a longer time without collapsing in an exhausted heap at the end of the journey. Of course it also means that once they reach the enemy, they're in much better shape to actually do some fighting. At the moment, researchers are evaluating just how much of an effect an exosuit like this can have on walking speed, muscle activity and energy expenditure. The suit works by using powered cables to apply forces that complement the body's natural movements - so soldiers are still in charge of the actual walking. This particular suit has been developed by Harvard University's Wyss Institute for Biologically Inspired Engineering. It's also what's described as a "soft" suit - the emphasis is on natural and comfortable materials rather than hard metal and rigid frames. Again the idea is to keep movements as flexible and as natural as possible. "It's like a rubber band," US Army Specialist Cacciatore told IEEE Spectrum. "You can feel tension, but when you take a step it helps pull your leg up and relieve tension on the muscle."